The 2.0-liter revs happily and gets you up to speed lickety-split. It might not have the low-end power of the 3.2, but neither does it have any of the accelerator lag exhibited by the A5 3.2 I drove. My test car had the standard six-speed manual, which is a joy to drive. The clutch is light and the shifter pops into each gate with precise, light throws. This is the manual transmission you want if you do a lot of commuting — and as the master of the 60-minute commute in the Cars.com offices, I am best qualified to offer this assessment. 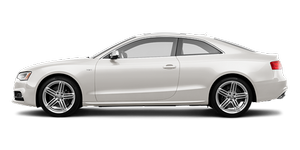 Steering is in the traditional Audi vein: power-assisted to an extreme at low speeds, with a more precise feel at higher speeds. What this does is rid you of the heavy lifting you need to do to navigate a BMW 3 Series up a parking structure. The ride was also fairly comfortable in daily driving. The structure feels rigid, but you don't feel major road imperfections, like bridge joints, as severely as you do in the BMW competition. The Infiniti G37 also has a nice balance of ride comfort and performance, with a nicer exhaust and more grunt under the hood.